97% of people start their search for a local business online– so pretty much everyone. Will they find your business? Our primary goal is to get your business’ website to the top of Google search results and on the first page. This is what we mean by on the line. Your business can achieve this by having a beautiful, responsive website, providing a clean user experience, search engine optimization (SEO), and utilizing social media. People are looking for your business. Can they find you? Google local listings, or the map, is one of 3 areas you can market your business on Google. 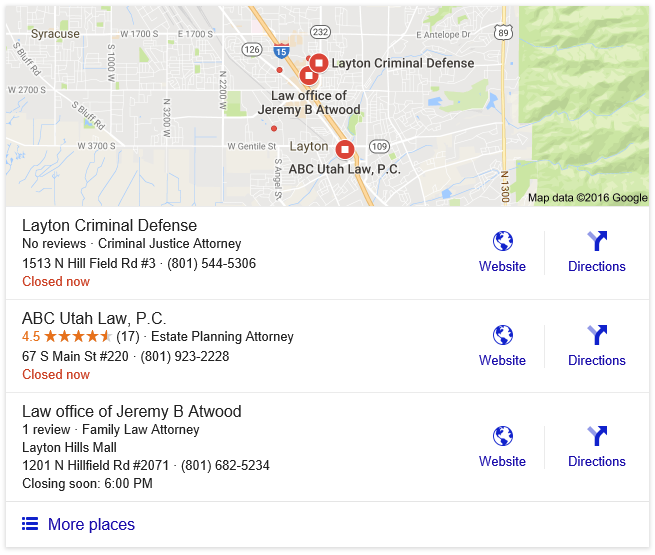 The other two areas are Google organic search results, which appear right below the local listings and paid ads, which appear at the very top. Google local listings are essential for every local business. Especially since everyone starts their search for a local business online. It is essentially the new phone book. On the Line Sites will place your business on “the map.” There are up to 7 local businesses that appear in local search results that are relevant to the users search. We’ll make sure your business is one of them. Google local listings are one way you can ensure your business is on the line and on the front page of Google. The local listings display your business name, phone number, address, ratings, and website. You can have your business displayed on the local listings withing a couple of weeks. Is your business appearing on the local listings? Organic results are the websites that appear right below the “maps” or Google local listings. These results are acquired through careful Search Engine optimization. A full SEO campaign can be expensive, especially for a small business. However, these results can be achieved by having an awesome, responsive website and writing quality content on your website using specific keywords. In the image you’ll notice the website www.laytoncriminaldefense.com. This is one of our sites. Without much expense at all, it appears in the top of local organic search results on Google. These are also called pay-per-click ads. These ads appear at the very top of Google and above the local listings. They rotate based on which company pays the most for a specific keyword search on Google. Get your business and website on the line. We will analyze which keywords people are using to find your business and use them throughout your website content to help boost your organic search results. Your business and website will be registered and added to the Google local listings. You’ll receive a PIN from Google to officially verify your registration. We’ll monitor your websites search engine results to ensure your business stays on the line and appears in relevant local business searches.